When the weather is warm smoothies are pretty much the best thing ever. Adri and I eat a lot of them fairly often but this recipe is our new favorite. A little while back we made them, then went and sat in the sun on the back step and looked up at the clouds while we sipped away. It's crazy how one minute your child is a tiny baby and the next they are a little friend. Someone to talk to and hang out with. It's totally awesome and I can't believe we are doing it all over again now! Anyway. Here's the basic recipe that makes enough smoothie for two (plus a bit extra). 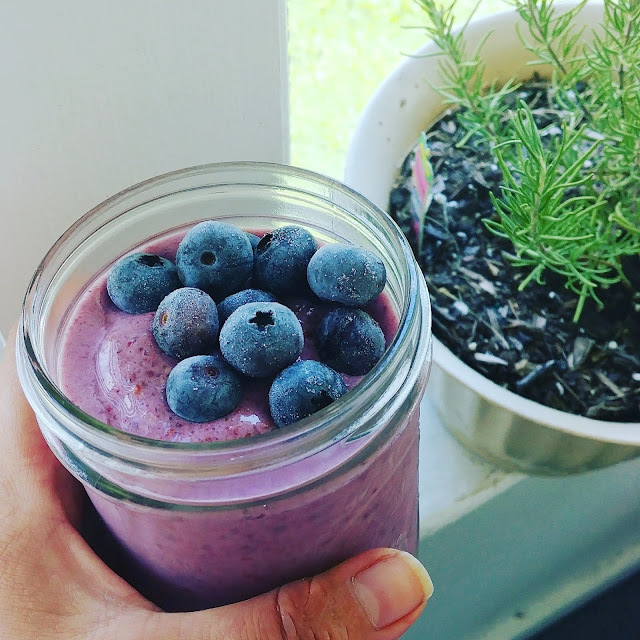 1 cup of mixed berries (blueberry and black berry). 1/2 a cup of plain greek yogurt. throw in the food processor (you could use a blender, but the food processor seems to work best for this) and blend it all up for about 3-4 minutes. You want it nice and smooth with no chunks. Toss some berries on top and enjoy! So glad to see this recipe! I wing it with smoothies and have less than spectacular results. This one is small enough to cut in half and will be perfect to make for just one little guy. And yes about the friend thing. Being friends with my firstborn was just the best surprise. I honestly never expected it, and with my almost two year old, I now have another little friend!